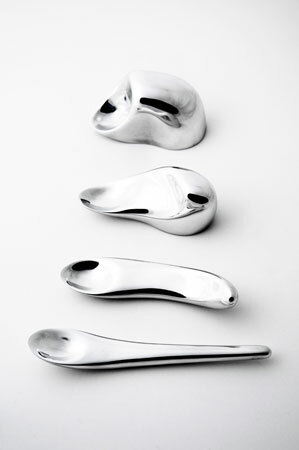 mickael boulay: transitional cutlery | Abler. A while back I wrote about a set of china from the Design for Dementia project, made to maximize independent eating for older users whose hand coordination is declining. 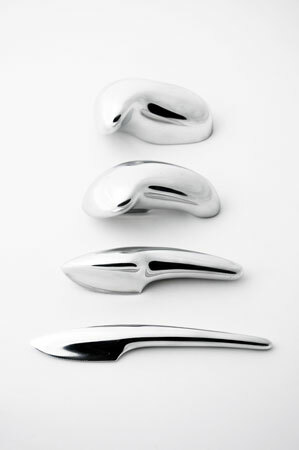 In this beautiful set of sculptural cutlery, Mickael Boulay provides an on-ramp for people developing motor skills for the first time—especially when those skills are already hampered by low muscle tone or coordination. Or perhaps these would work at both ends of the life cycle, and for therapeutic skill-building times in between as well. “Transitions” morphs the knife, fork, and spoon from blunter objects that push food around to the refined spearing and scooping models of these familiar objects. Transitions : the story (Updated version) from mickael boulay on Vimeo.